Click to contact the nearest dealer. 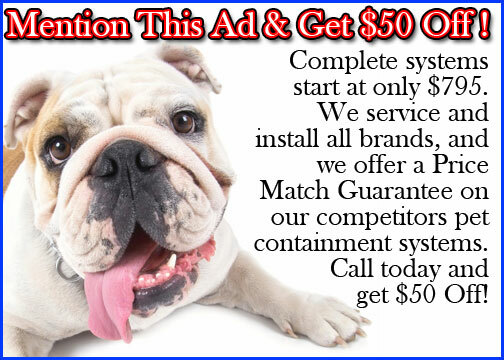 We strongly recommend that you view our infomercial on the homepage, which provides a friendly yet informative overview for our wireless pet containment systems, the training program and other frequently asked questions. After your signal wire is buried to define the area(s) of containment (indicated in white to the right), boundary flags are setup within the perimeter of the signal wire. During the early days of training, you walk your leashed dog around the inside perimeter of your pet containment area, and verbal commands are used to train your pet to avoid the boundary flags. 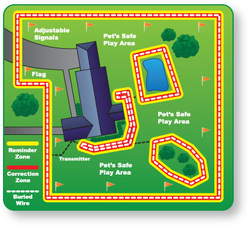 After your system is activated, when your pet enters the reminder zone (in yellow) 3 to 6 feet from the signal wire, they receive your choice of an audio signal or a mild correction stimulus, warning that they are approaching the boundary. If they enter the red correction zone, they receive a stronger correction. Transmits the radio frequency to and throughout the buried signal/boundary wire. Also controls the depth of the correction zone, (the signal field or distance from the wire before a reminder or correction stimulus is used). Automatically disconnects the transmitter in case of AC power surges and lightning. Worn by your pet and used to produce a tone or correction stimulus when they enter the reminder or correction zones (i.e., the signal field). Used to protect the receiver from damage by your pet. Carries the signal from the transmitter that defines the areas your pet can and cannot go, but does NOT carry any current of any kind*. Used during training to help your pet visually recognize where they can and cannot go. To ensure their reliability and performance, Dog Guard batteries are specially welded together. Unlike our competitors' multiple cell batteries which run the risk of breaking contact, DG batteries maintain 100% connection. Sign up for our optional Battery Plan, and help insure the safety of your pet while avoiding the chance of receiver problems stemming from battery failure! *Dog Guard® Out-0f-Sight Fencing® is a trademark of Sunward Electronics® and should not be confused with Invisible Fence® (InvisibleFence®). Invisible Fence® and Invisible Fencing® are registered trademarks of Invisible Fence Company.